Gennadiy was previously employed with Levine Associates as a law clerk and now returns as an articling student. Unlike most students Gennadiy comes to us with a wealth of both educational and practical experience. He earned his Juris Doctor degree from the University of Windsor Faculty of Law and the University of Detroit Mercy School of Law dual degree program. Prior to that, he completed legal education and practical training in a civil law jurisdiction, followed by a Master of Laws program at the University of Toronto Faculty of Law. During his studies, Gennadiy focused on citizenship, immigration and refugee law as well as comparative and international criminal law and procedure. 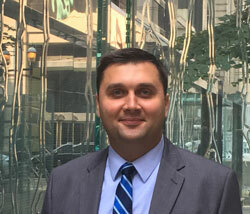 Gennadiy’s LLM thesis was devoted to researching the issues of extradition in criminal procedure and its interaction with immigration and administrative law. Gennadiy is also a licensed Immigration Consultant. In that capacity he assisted corporate clients from Fortune 500 Companies at Fragomen Canada, focusing on intra-company transfers of specialized knowledge personnel and senior managers and executives, Labour Market Impact Assessments and exemptions as well as criminal inadmissibility issues. Gennadiy has also gained practical experience in the United States while interning at Fragomen in Troy, Michigan, where he worked on corporate immigration files. Prior to his return to Levine Associates, Gennadiy interned at the Office of the Prosecutor of the International Criminal Court in The Hague, the Netherlands. While studying law at Windsor, Gennadiy volunteered at a legal aid clinic and participated in the Zuber Moot Court. He also received an award for academic achievements in the Trial Practice course at Detroit Mercy Law and placed second in the Patrick Kennan Moot Court. Gennadiy is married and has a son. He is passionate about the rule of law, and in his spare time enjoys playing chess and basketball.